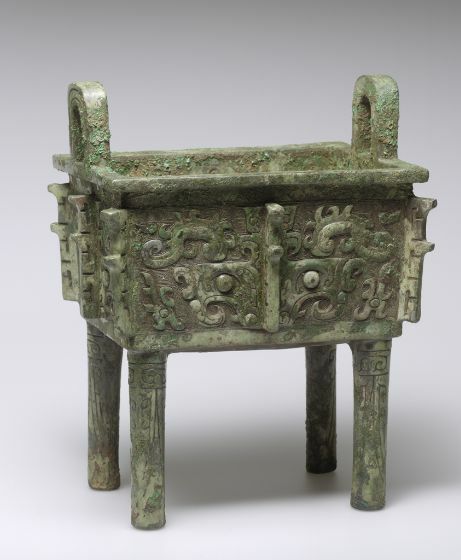 Here is a bronze ceremonial vessel called a fang ding from China’s Western Zhou period. 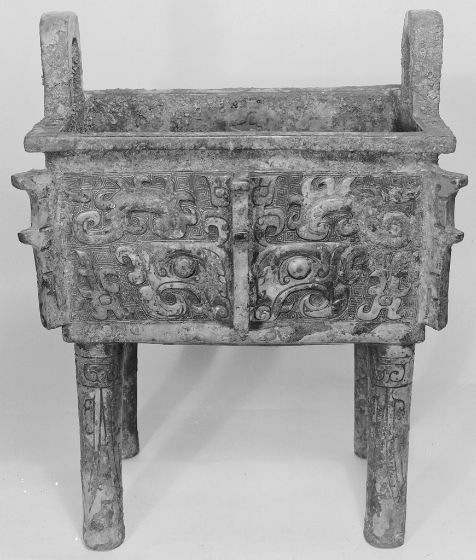 The vessel dates from the eleventh or tenth century BC—so it is probably from Shanxi or Shaanxi (which are the modern provinces located where the Zhou culture began). The ding was used for ceremonial food offerings, but it was also a status object which represented power and authority over the land. It is covered with an enigmatic pattern known as a taotie, the true nature of which has perplexed and intrigued experts in Chinese art for centuries (or even millennia). Most scholars believe that the markings are a stylized face—possibly the countenance of strange spirit beings encountered on shamanistic spirit journeys. According to anthropologists there are extant hunter-gathering cultures which participate in such transcendental rituals—and craft similarly stylized faces (so I’m not making all this up—however anthropologists might be). The Chinese term for the decorative faces (or whatever they are) is 饕餮 which apparently translates as “glutinous ogre” which seems like a very poetic and apt name for the weird powerful designs. During the Shang dynasty (which preceded the Zhou period) the analogous ceremonial vessel was a wine container, but the founding king of Zhou was a strict moralist who believed the Shang had declined due to drunkenness and inebriation. Perhaps some of the shamanistic overtones of the bronze vessels vanished as the authorities reinvented dings as a symbol of authority rather than a portal to an altered state!